can you post more of the solutions for this chapter soon? specifically 17, 25, 35, 39 and 47? I don't understand them at all and I have a test approaching soon. 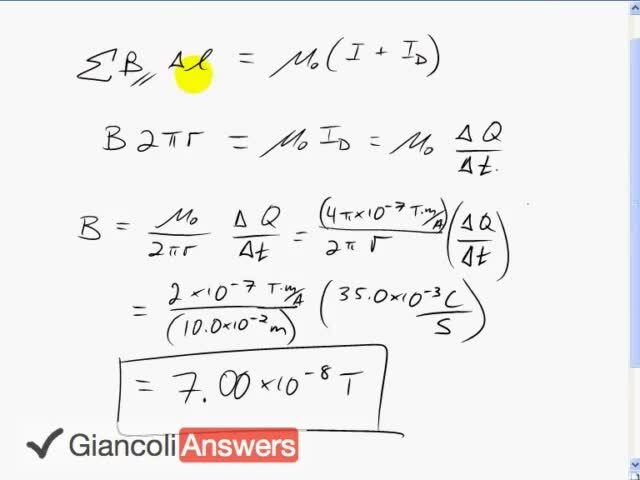 Do you have the solution to the second part of the question: What will be the magnitude of the field after the capacitor is fully charged? Sir for some reason I can not even get close to the correct answers on number 1 and number 19. Is there a way you could please work them for me to give me the ground work for studying? Hi guidotn, thanks for the heads up that Chap. 22 is missing the odd questions, and I'm sorry about that. Currently I'm working on the 7th Edition of the textbook, so I don't think I'll be able to get to the odd questions here soon, unfortunately. Hopefully you can find an even solution that's similar to numbers 1 and 19, and apply the same problem solving strategy?